How auto dimming mirrors work and what safety they provide? What are auto dimming mirrors? Auto dimming mirrors are the special type of rear view mirrors that have the capability to dim the light reflecting from their surface. These mirrors reduce the glare of light coming from trailing vehicles significantly thereby reducing the driver fatigue. Naturally, such mirrors prove to be very useful while driving on heavy traffic roads at night. Internal as well as external rear view mirrors fitted on a vehicle can be of this type. A quick glance on the history reveals that auto dimming mirrors were invented in the late 1950s. However, their commercial application started after year 1980. Gentex is one of the most reputed manufacturers of auto dimming mirrors. Why to use auto dimming mirrors? Glare of the light from behind that reflects from the mirror irritates driver a lot while driving at night on a busy road. It also results in poor visibility. Prolonged exposure to such light induces a severe strain in the driver's eyes. According to scientific studies, such a glare almost doubles the driver's response time thereby increasing the risk of accidents. Manufacturers employ auto dimming mirrors in order to avoid such mishaps. Now, these mirrors are gaining a rapid popularity in vehicle industry. Ambient sensor: Senses the ambient light. When it senses low ambient light, it gives signal to control unit saying that it is time to start working! Glare sensor: It measures the intensity of the light falling on the mirror and sends corresponding signal to control unit. Control unit: It monitors functioning of both the sensors and takes decision of reducing the glare. Auto dimming mirror has a sandwich type construction and works on the principle of electrochromatism. It comprises of a mirror and a plane glass. 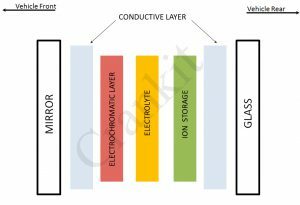 Two conductive layers are placed side by side to each of the mirror and the glass. Between these conductive layers, ion storage, electrolyte and electrochromatic layers lie. After control unit orders to reduce the glare of light, the system applies an electric voltage across the conductive layers. This causes ions to flow from ion storage layer to electrochromatic layer causing it to darken thereby reducing the amount of light reflecting from the mirror. Thus, it achieves glare reduction or dimming. It enhances visibility at night which is otherwise hampered by glares from other vehicle lights. Improves safety due to better visibility. It reduces strain on eyes and driver fatigue. 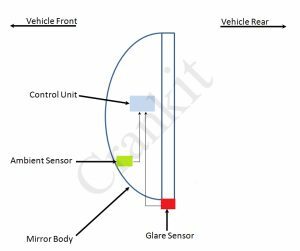 Home » Technical Anatomy » How auto dimming mirrors work and what safety they provide?